Constant vehicle movements, hydrocarbon spillages, tool impacts and high levels of repetitive pedestrian movement make the workshop environment a challenging one to manage. Combine these with the apparently constant trade off between slip resistance and cleanability, and safe operation can become a nightmare. Over the last twenty years we have developed a number of floor refurbishment options that can assist. These include a lightly textured epoxy finish that can meet the HSE requirement for low risk of slip in both wet and dry operation, and yet clean easily with off the shelf detergents. 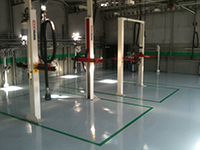 We have installed new flooring in over fifty vehicle workshops over the last two years for customers ranging from Humberside Fire Authority and Blackburn Council to MAN Trucks and Ryder Vehicle Hire. 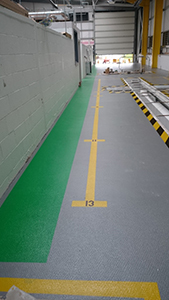 Our applications have been on floors from 100 sq m up to 4000 sq m so we can cover any requirement, including walkways and line markings to meet safety and VOSA MOT regulations.